Over the past 5 parts in the chord progressions section, we've been building what's known as the diatonic chord scale - 7 chords built upon the degrees of the major scale. There are 3 remaining chords to complete this foundation scale. By just playing around with the 4 chords we've already added (I, ii, IV and V), you can create simple, 4 chord songs using different chord combinations and variations. You may even recognise some of these combinations used in songs you know. This scale is used by songwriters more often than you might think. It's where many of those "radio friendly" hit songs come from, but classical music also uses the scale. However, I don't want you to be restricted to this scale, so we will build on these foundations in later lessons. In this lesson we're going to add the 6th degree of the chord scale - the vi chord (or 6 chord). As with the other chord positions we've been learning, don't worry about what the name "submediant" means, just get to know its relationship with the other chords in the scale. The submediant, in its natural form, is a minor chord, represented by the lower case numeral vi (6), but as we'll learn later, we can turn it into a major VI chord. The vi chord is often referred to as the relative minor of the major key tonic (I). This is because when playing in a minor key, the vi chord becomes the new tonic. More on this another time! Now, as we're building chords on this 6th degree, we need to know its position on one of the lower strings of the guitar, as this will be the bass root note for our vi chord and gives us a good visual reference for playing between chord relationships. ^ With the tonic rooted on the A string, the same submediant position lies in two immediate places. The position on the low E string allows us to build barre/movable chord shapes that use a low E string bass note (or at least use this root position as a reference point). You can see also how this then links to the first diagram, with the vi on the low E string. If you know your interval names, the tonic can be seen as a minor 3rd interval from the vi chord. This whole step V - vi relationship interval is the same on the E A and D root note strings. Learn how these root note positions sit alongside each other in their sequence. 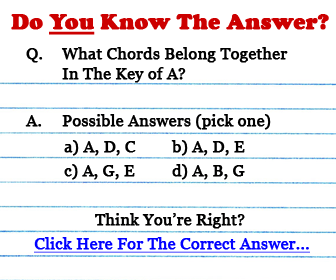 Once you learn their positions, you'll be able to move between the chords intuitively. Just from hearing/playing this, you may recognise this movement as used in many popular and classical pieces. The relationship between the tonic and submediant is similar to that between the tonic and subdominant - it's a relaxed movement that doesn't create much tension/resolution at all (unlike the relationship between the tonic and dominant, for example). By now, you should know what the next stage is! Yep - simply experiment with different combinations of the chords in the scale and try and memorise their positions in different keys. So, just like in previous lessons, I'll show you a few example combos. Remember, you don't have to use all 5 chords and you don't always have to begin on the tonic chord. Note that, because the positions of some of the chords in the above key of A major, I was able to use those common open chords in place of barre chords. Something to think about. The most important thing is that you learn, using both your ears and eyes on the fretboard, these relationships in any key. It's all about relative movements. If the tonic chord changes position, so does the rest of the chord scale, along with the major key centre, but the scale's intervals remain intact. Over time, you'll be able to "feel" when, for example, a vi chord might be an effective addition to one of your chord sequences. By learning its sound in relation to the other chords in this scale we're building, that feeling will become more and more intuitive.